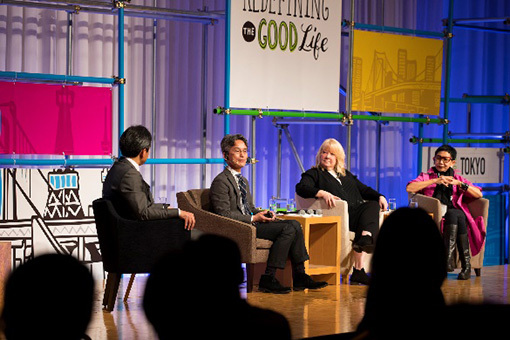 We carefully curated a group of world leading speakers focused on redesigning the Good Life for brands, consumers, the planet and society as a whole. Sessions covered how businesses can drive meaningful change, positive impact and business success through ground-breaking insights, new research data and new tools driven by sustainability-led innovation. Plenary Sessions will be held in the Morning on Day 1 and Day 2 by world leading speakers. The conference program spills over 2 days and includes ground-breaking insights, new research data to help grow your business, and updates on new tools to support your initiatives. Learn how to define and embed social and environmental purpose in a brand across all touchpoints, both externally and internally. Discover how to initiate and grow positive brand activism with new strategies and courses of action. Gain insight into how to use the power of brand influence to support and encourage sustainable lifestyle. Understand how to use that latest research and leading tools to grow a business through purpose and how to support Good Life values through easily digestible and engaging campaigns. Master how to design for balanced simplicity, meaningful connections, health, transparency, inclusion and other principles of The Good Life. Explore how to upgrade organizational structures, teamwork, partnership development, hiring norms and benefits in support of Good Life strategies. Uncover how to enter into top-notch cross-sector partnerships that tackles far-reaching complex systemic challenges while factoring in accessibility, inclusion and other integration value. Identify approaches that the titans of sustainable, leading retail brands are taking to redesign products and reinvent experience during a period of profound industry transformation. Dive deep into how to evolve supplier relationships and tools to tackle forced labor and other critical issues in complex supply chain. Grasp how to come together to help solve ethical dilemmas in store for brands when it comes to the rapid advances of AI, IoT and blockchain and more. Divergent and convergent thinking helps us look beyond the usual methods of solving problems. The two major events of regional revitalization will be held in SB 2019 Tokyo. Take advantage of this opportunity to expand your stakeholder engagement and business matching. Join the Innovation Open to learn how we are making a sustainable future at Activation Hub. Day1：March 6th, 12:25 - 13:10 Coming Soon. Day2：March 7th, 12:25 - 13:10 Coming Soon. DAY1 - 6th March Wed.
What is next-generation CSV (value creation) management ? Managing Director of Sustainavision Ltd.
President & CEO, SDG Partners, Inc.
Senior Partner, Recruit Holdings Co. Ltd.
YOKOHAMA DeNA BAYSTARS BASEBALL CLUB, INC.
* Not required to select in agenda. Please come to Activation Hub to join. DAY2 - 7th March Thu. Corporate Officer and Director, Sun messe Co., Ltd.
CSR&General Affairs Unit/CSR&General Affairs Div/CSR&Environment Dept. 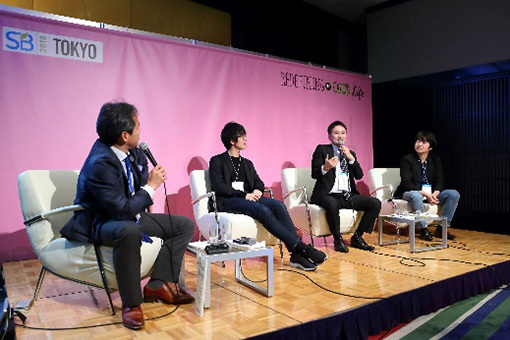 KEEP WILL DINING CO., LTD.
Sompo Holdings, Inc. & Sompo Japan Nipponkoa Insurance Inc.
As social issues are too complicated for any single sector to solve, there is significant need for collaborative activities between the business sector and NGOs. ACE, a Japanese NGO, has initiated collaboration with Deloitte Tohmatsu Consulting (DTC) to take a significant step toward the elimination of child labor in the cocoa sector in Ghana. ACE has been working on a project to tackle child labor in the Ghanaian cocoa industry since 2008, and has been able to establish a system for local residents to monitor child labor and solve related issues. A collaborative effort with the Ghanaian government to develop a Child Labor Free Zone mechanism was initiated in 2018. DTCand ACE share expertise to establish this “Ghana model” and formulate international rules to eliminate child labor globally. We will present the full scope of this challenging project, in which all participants bring their respective strengths to the table, looking to change the world while staying true to economic logic. Looking towards 2030-2050, humanity if facing at least four survival bottlenecks, requiring us to deliver "4 Revolutions" in Food & Agriculture (incl. protein), Water, Circular society ＆ Resource Use, and Energy ＆ Climate Change (incl. GHG emissions). In this session, we will be connecting briefly with next generation innovators in South America and Asia to discuss a Global Innovation Challenge called "4 Revolutions" starting in 2019. Please join this short lunch session and join the exploration of THE biggest business themes on the planet! In recent years, CSV businesses have attracted a great deal of attention as it has created long term values for the environment, society and companies by solving social issues. Through the collaboration of shared values, CSV can play an important role in helping companies with entry of developing markets which are important for the steady growth of future business. However, with the exception of a few advanced companies, many have been unable to fully utilize CSV as they are continuing to evaluate risks and opportunities with outdated lenses, while companies that capitalize on their strengths and play an active role in fast-changing markets of developing countries have initiated new social businesses. In this panel discussion, the executives who are at the forefront of various social businesses have been invited to discuss the success factors and challenges, risks and values, the ecosystem surrounding CSV businesses, and finally, the potential role which large companies can play. SDGs play a key role in guiding the organization’s vision in business, with the public, and with government. In this regard, transformational change is critical for leaders and organizations in developing and achieving sustainability initiatives. However, there are many criticisms related to the sustainability movement. Common examples are that most employees don’t even understand what the term “sustainable vision” means, or that workers think the CSR division is solely responsible for sustainability issues of the organization and not themselves, and that CSR’s efforts are really focused on creating only fancy looking reports about sustainability. The criticism reflects how the company is only trying to project a good corporate image with these fancy looking reports on sustainability. In effect, the company is merely “SDG washing,” instead of producing actual tangible results. At the heart of the matter is the lack of internal communication and meaningful dialogue about sustainability. This lack of communication creates suspicion and cynicism about all sustainability initiatives within the organization. Resolving these internal conflicts by engaging in deeper dialogue within the workplace is critical in order to effectuate authentic change. I invite leaders who are tackling organizational change using Organizational & Relationship Systems Coaching used by NPOs and business corporations to join. I will also have some “hands-on” demo-sessions for participants in understanding how to utilize dialogic approaches effectively, to resolve and go beyond internal conflicts, and to bring awareness and a call-to-action for sustainability issues throughout the workforce. In corporate management, innovative response to "sustainability" is demanded under intense change both inside and outside. ESG (environment, society, corporate governance) investment has been accelerated. In particular, the Paris Agreement for E, Sustainable Development Goals (SDGs) for E and S and G, and Corporate Governance Code Application for G. Year 2015 is the "first year of ESG".Now sustainability is an essential element that cannot be avoided for the brand strategy. Amid this drastic change, the international common language for sustainability management is the SDGs with the target year of 2030, adopted at the United Nations Summit in September 2015. It is also indispensable for the 2020 Tokyo Olympic and Paralympic Games and for inviting the Expo 2025 to Osaka. We aim to create shared value (CSV) aiming at simultaneous realization of economic value and social value by thoroughly utilizing SDGs both in business opportunities and risk avoidance. In order to redesign society, SDGs is necessary to be explored by the front line of efforts of the three pillars; Society 5.0, the future city of SDGs and future generations training and female success. We also refer to the Japan SDGs Awards and explore a new global competition strategy of SDGs implementation. Leaders in innovative finance will share their views and ideas how innovative finance could make a difference in Japan and the world. The discussion will cover from best practices to the global trend. Together with the participants we will envision the future of sustainable finance. Hints from Case of Sharing-Economy Services to Combine Social Welfare and Economy. Based on the efforts that Recruit Holdings challenged by practical case examples at the SB subcommittee for SB-Japan Forum members from September 2018, challenging SDGs can not be terminated by mapping alone, we will discuss about "Beyond the SDGs mapping" sprinkled with the Ajinomoto Group's challenge a summary of previous three subcommittees 1)"Sustainability Orbit and SDGs Domino", 2)"Linkage, Moon Shots and implementation of SDGs in management - based on advanced case examples", 3)"Moon Shot as a method of SDGs as a business strategy and Design Thinking". We will discuss about topics such as "We understood the importance of SDGs, how should we reflect it in our business? ", "We mapped SDGs and business,Does it truly lead to corporate value? How should we communicate SDGs' efforts internally and externally in an easy-to-understand manner? Companies need to respond quickly and appropriately to new risks and opportunities created by major trends (mega-trends) for their long-term growth. They are required to identify “disruptive points” that are not limited to market and customer analysis but also on long-term environmental and social analysis and consider the movements of new stakeholders like local communities and NGOs. Many global companies are proactively approaching risk management as well as developing new services while taking into consideration the concept of sustainability. In Japan, while sustainability management has gradually gained attention in response GPIF's investment in ESG, many companies still doubt whether it is really important for their business and are exhausted from the growing demand for the disclosure of non-financial information. In this panel discussion, we will discuss with leading companies how to implement sustainability management for the companies’ long term growth alongside society. Sustainable Brands, together with our global community and alongside others working toward a better future, seek a world that is delightful diverse, safe, health and just, with clean air, soil, food, water, shelter and power, equitably, ecologically and sustainable enjoy by all. We believe that brands are in a unique position to command the attention of and influence the global economic ecosystem in such a way as to accelerate this vision and that those brands that lead the way will be the business leaders of the future. Through our history together, our global community of brand change-makers has made great strides against the goal of redesign business for a sustainable future. And yet we have far more to go, No one company can yet claim to be a fully “Sustainable Brand,” as we see it. We have, however, become clearer about the core characteristics that would be present with in a brand that embodies the change we seek. In this session, we will introduce the SB Brand Transformation RoadmapSM which is the self-assessment tool that helps companies navigate the path to full sustainability, unveiled in SB’18 Vancouver. Companies are still approaching sustainability in different ways and, along with the many challenges, there is no one clear path to success. Even though there is a trend that the Japanese young generation are sustainable minded in the recent years, not so many companies have a solution for rebuilding their strategy for Good Life. This session will try to give implication to Good Life Redesigning Strategies from identifying the characteristics of Good Life oriented consumers using qualitative and quantitative research analysis. "Corporations are identified as one of the main drivers of the SDGs (Sustainable Development Goals). The corporate community creates social impacts through core business and CSR-related activities, and enhance the social value of the company itself. Corporate activities run through the value chain, involving many stakeholders that include managers, employees, suppliers, business partners, consumers, and local communities. The potential for maximizing social impact is enormous, which can be accomplished by working with the stakeholders in agreeing on the social impact born by business, setting goals and achieving them. In this session, the following questions are posed: - What is the social impact that companies want to generate? - How can we visualize social impact and try to foster common recognition with stakeholders? We will then discuss how ""impact management"" can advance social impact at companies and social sector organizations." "An exciting new book launching at SB’18 Vancouver, All In: The Future of Business Leadership looks at the scale and pace of change that the environment and society are experiencing through the lens of sustainability leadership, particularly the private sector’s contribution to ameliorating the sustainability challenges facing the world today. While seeing sustainable development as a universal challenge in which governments, civil society and citizens all have roles, All In focuses on the role of the private sector and concludes that business leadership on sustainable development is central to developing and maintaining the kind of markets and economies that the environment and society need to thrive. Join this session to find out more." The history of the Ajinomoto Group began in 1909 when Saburosuke Suzuki II started marketing umami, which was discovered by Professor Kikunae Ikeda, as a product called "AJI-NO-MOTO®". Since then, the Group has expanded the seasoning "AJI-NO-MOTO®" and a variety of products worldwide, with the founding spirit of “Eat Well, Live Well.” The Ajinomoto Group has been engaged in initiatives to resolve social issues through its business. These initiatives for such creation of shared value have been named ASV (Ajinomoto Group Creating Shared Value) and we develop businesses centered on ASV. We have established “Health and well-being,” “Food resources” and “Global sustainability” as three important social issues to be resolved through ASV, and also identified several materiality items through the dialogue with stakeholders. We are confident that we will achieve our goal of becoming a global top ten class company by solving issues and evolving value creation through ASV, and that we will continue to grow in a sustainable manner. 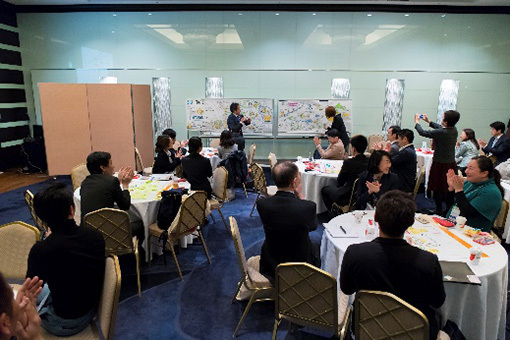 The presentation shows the Ajinomoto Group's efforts to resolve social issues through ASV and its sustainable growth. Epson exists to enrich lives and contribute to a happier world. As a company, Epson has to make a profit, but that profit has to be the result of earning customer trust. Epson’s Management Philosophy articulates a goal of sustaining growth and being indispensable to stakeholders by earning trust and profit. Epson has long contributed to solutions to social challenges through the products and services it provides. All the actions it takes help to achieve greater sustainability. Epson will continue to work toward making itself indispensable by playing a central role in realizing a better world. In his talk, Mr. Usui will describe what Epson is trying to accomplish through its initiatives, innovations, and products. Marc Pritchard, Chief Brand Officer of Procter & Gamble, will share insight into how P&G is enabling and inspiring positive impact through its brands. By asking tough questions, the company is finding new ways to be a force for good and a force for growth. Since the opening of the Mirage in 1989, Las Vegas has witnessed frequent openings of mega resort hotels and casinos, one after another. The number of tourists coming to the Entertainment Capital of the World grew from 20.9 million in 1990 to 33.8 million by 1999, and the population of Las Vegas also grew by more than 60% in the same decade. During this rapid growth period, Ms. Jan Jones Blackhurst, Executive Vice President, Public Policy & Corporate Responsibility at Caesars Entertainment, was the two-term mayor where she was known for her coalition building skills and support for women in the workplace. Jan’s unique experience of balancing economic and community growth – the challenges as well as the opportunities - helped pave the way for her tenure at Caesars Entertainment, where today she leads PEOPLE PLANET PLAY, the company’s strategic framework for CSR. She will share with you her valuable experiences of a mayor for 8 years and an EVP of Caesars for 20 years.